The geocaching map could use some more features, like regular old filters. On the left, you can turn off types of caches (traditional, Earth, virtual, event) but you can't do something like "all caches with 5+ Favorites." I think those filtering options should be available right up front. I suspect that option might be available in Pocket Search, but I don't want to learn all about Pocket Searches. Click on Change Filters to set the options that you would like, then a list will appear. In the upper right corner will be Map These Geocaches, which will then show the familiar map with the filtered caches. I think it's a workflow thing. 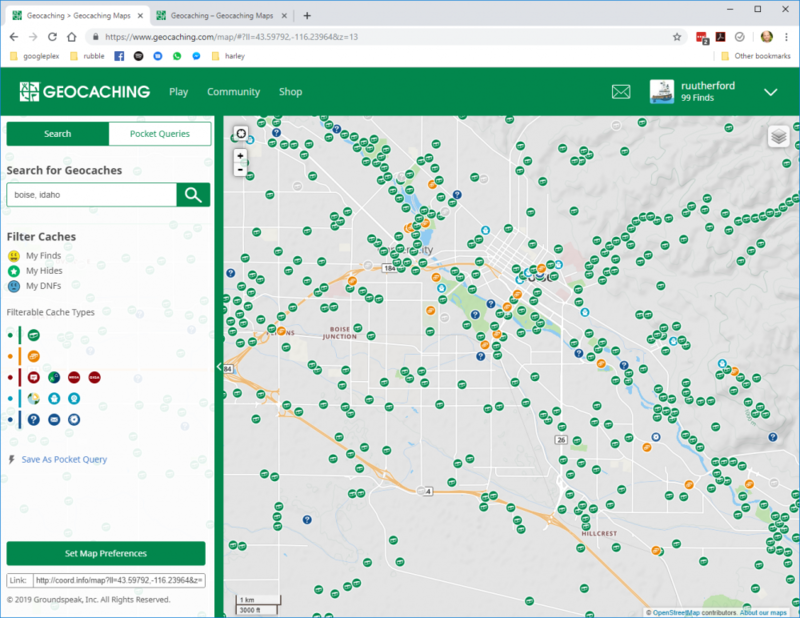 From the main page, which defaults to https://www.geocaching.com/play/search, I can search for Boise Idaho. 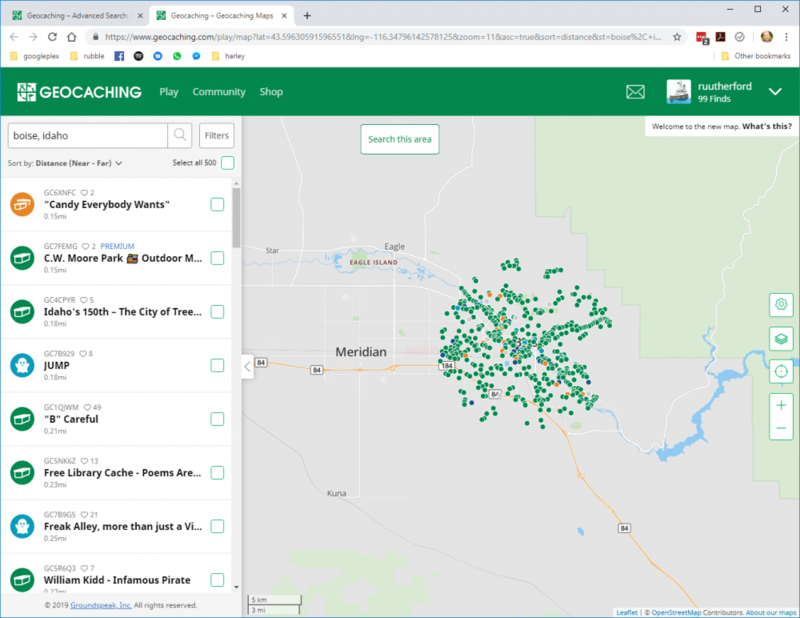 As I'm typing, it pops up suggestion, and I'm presented with a sortable list of geocaches, along with specifications like a default 10mi radius for searching. When I'm at the main page, and hit Play > View Map, there is also a search bar on the left titled "Search for Geocaches" but it's not as responsive (?) as the initial search field. When I search for Boise Idaho in there, I get no pop-up suggestions. While it does take me to Boise Idaho, there are no options for filters or anything. I hit Map These Caches, and get a much more interactive map ("Search this Area," Filters button, sorting, selection boxes) that I really wanted from the other map I mentioned above. These seem like two ways to get to a map, that are very different views and functionality. Yes, there are two different map experiences. The "Browse Map" (Play > View Map) which shows all caches, with a few limiting choices. The "Search Map" which is a mapping of a database search, based on the Filters chosen (radius, placed by, etc.). Each experience has specific usefullness to many of us, once you determine which is best for the situation.